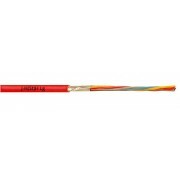 Basic Conductor : solid, 23 AWG bare annealed copper. Number of insulated conductors : 8, twisted in 4 pairs. Individual pair shield : polyester-aluminum foil (foil face out). Overall shield : tin coated copper braid. PVC compound for outdoor use. Short Term Bend Radius : 8xOD mm. Long Term Bend Radius : 4xOD mm. Operating temperature : -20 to +60° C.
Installation temperature : 0 to +50° C.
Flame Test : IEC 60332-1. 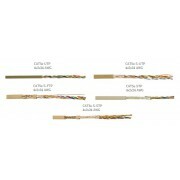 The construction of CAT 5e UTP, CAT 5e ﻿S-UTP, CAT 5e﻿ S-FTP, CAT 5e﻿ STP, CAT 5e ﻿S-STP﻿ varies from type to type. However, they share similar characteristics. They all have the inner conductor made of plain copper with a Ø﻿ of 0,51 mm, insulation made from polyolefine compound. 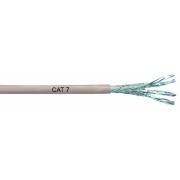 However, CAT 5e UTP, CAT 5e ﻿S-UTP, CAT 5e﻿ S-FTP, CAT 5e﻿ STP, CAT 5e ﻿S-STP﻿ cables have some differences in characteristics such as pair screen, drain wire, overall screen, braid coverage or outer sheath. ﻿The outer sheath diameter of CAT 5e UTP, CAT 5e ﻿S-UTP, CAT 5e﻿ S-FTP, CAT 5e﻿ STP, CAT 5e ﻿S-STP﻿ cables ranges from﻿ Ø 5,50 mm ﻿to 6,60 mm. 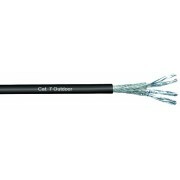 All the details of CAT 5e cables can be found in the PDF.